We are currently in basement-finishing mode. J does all the work and my role is largely 1) schedule Hannah’s naps around construction efforts (harder than you’d think! ), and 2) be completely overwhelmed about making decisions on all the finishes. 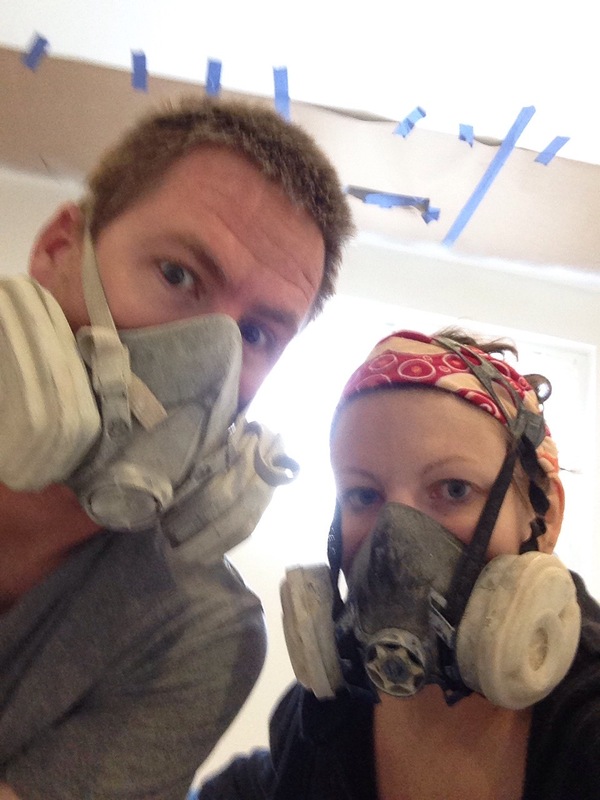 We are definitely DIYers and use-what-we-have-ers, so for me choosing all the paint colors, flooring, etc is not just about what I like the best. It’s also about using what we already have, stretching our budget, and being responsible consumers to the max extent possible. I don’t want to make mistakes that I end up wanting to fix a couple years down the road, but I don’t want to settle on the most simple and neutral, either. 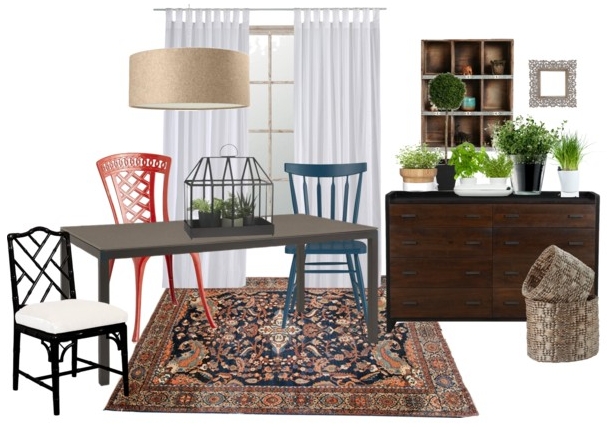 I’ve been creating mood boards on polyvore that I will share soon, which are really helpful to me for planning. I make a quick digital mockup of the room’s style, color scheme, etc using as many items as I can similar to what I already own. I’ve made and blogged quite a few of these (like the dining room one below) in the past because it’s fun and what works for me. The challenge, and the fun, is to tie it all together in a way that represents our family style and budget. One thing I struggle with in every decision-making aspect of my life is focusing and narrowing down my style. The mock-ups really help, but my style is pretty eclectic. To reign it in and keep it from getting too thrift-storish, I have been trying to focus on a color palette. But I never really defined what that is until now. 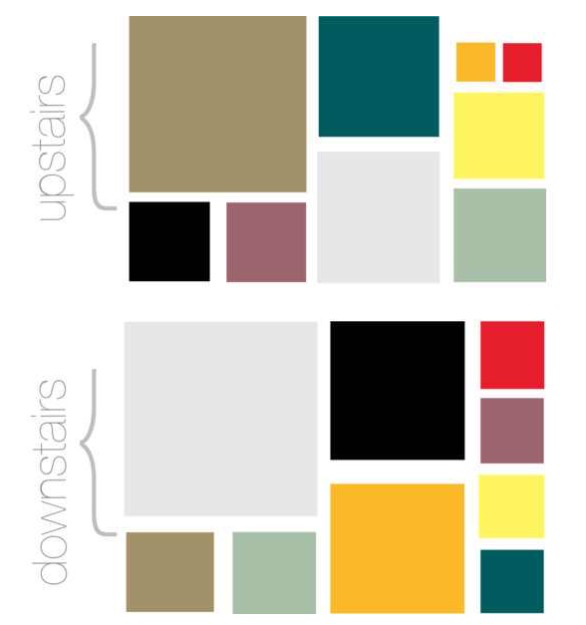 I came up with two similar and coordinating palettes for each level of our house. Our house doesn’t fit within the parameters of these palettes and maybe never will, but it should really help me make future decisions that don’t derail our budget and look. I chose each based on what we already own and the mood I’d ultimately like to shape our house into. It is pretty neutral and airy with doses of dusty blues and teals, and smaller pops of more dynamic and warm colors I am most drawn to (Orange/coral, yellow, and purple). More later on some of our plans for our spaces.